Today we have a guest post from Kristina Brown at Road Scholar Transport, one of our generous corporate partners. The Children’s Craniofacial Association and Road Scholar Transport are helping to spread awareness for those children affected by craniofacial differences in a large way. Weighing in at a maximum 80,000 lbs. 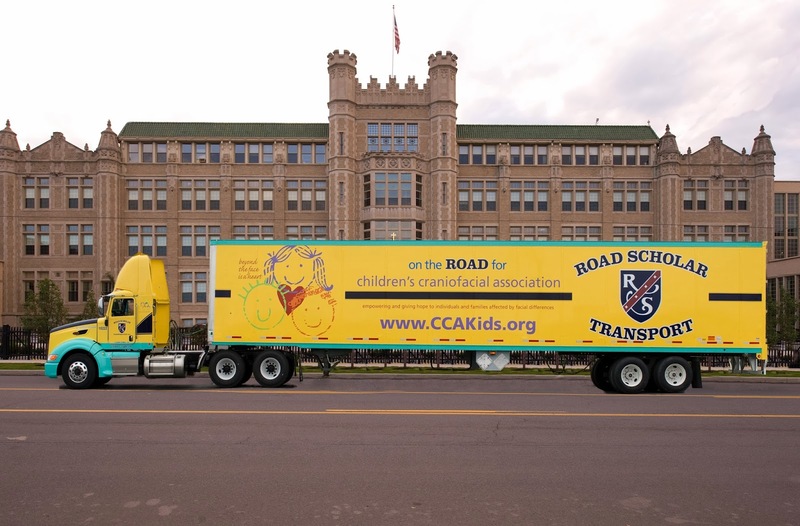 and covering 53 feet of road, Road Scholar’s bright yellow CCA awareness tractor trailer is traveling across the country, delivering freight while spreading a powerful message…that beyond the face is a heart. It all started back in 2007 with the creation of a pink breast cancer awareness truck, marking the beginning of Road Scholar Transport’s awareness program, which has now grown to support over two dozen different organizations from Autism awareness to Supporting our Troops. “My mother-in-law, Marlene Deily, worked at Schott Glass Technologies (she is now retired),” explains George Dale, who is on the Board of Directors for CCA. “Her colleague, Ed Hart, was aware of our son Jeremy (who has a facial difference known as Goldenhar Syndrome) through her and was aware of our fundraising and awareness efforts for CCA with the Friends of Jeremy Golf Tournament. Her colleague thought there was a good link there between CCA and Road Scholar’s awareness efforts." So Jim Barrett, President of Road Scholar Transport, and Ed set up a lunch meeting to discuss the potential of a CCA truck joining the campaign. Jim, however, was extremely busy at the time and arranged for them to meet again in a month or two to revisit the possibility. But as the two of them were walking out of the empty restaurant, in walked a girl who clearly had a facial difference and Jim’s jaw quickly dropped. “It was a divine message. That was not an accident that that girl walked in there,” Jim said. He turned towards Ed and stated, “It’s not a question of IF anymore. We ARE going to do it.” And working with Robin Williamson, one of the CCA’s board members who is a graphic designer, the Children’s Craniofacial Association trailer was soon created on behalf of Jeremy Dale. “Jeremy was the happiest kid in the world when he saw that truck and I couldn’t help but cry,” Jim reflects. But with over two dozen charities featured throughout our fleet, each individual truck and organization holds a special meaning and place in our hearts. Road Scholar Transport is proud to feature Children’s Craniofacial Association and especially, to support and spread CCA’s message that it’s not what you look like on the outside, but who you are on the inside that matters and makes a difference. Seeing the excitement on people’s faces when we attend events with our trucks, such as the 2011 CCA family retreat in Louisville, KY, gives us a warm feeling as well as honor that we are able to represent such a worthy cause. For more information on our awareness program and to view our CCA awareness truck visit www.roadscholar.com. I also wrote a post for the RST Blog which you can see here. Thanks again, Road Scholar!